New Mexico, Land of Enchantment and Whoop-De-Do’s. Previously, I’ve written day-by-day travel accounts on my voyages from Illinois to Arizona and back. Not this trip, since these long-distance transports of the Mighty Defiant are simply that – eight days of driving a total of two thousand miles at sixty MPH, and stopping to overnight at the closest workable facility. Depending on the state, that includes Interstate rest stops, truck stops, city park campgrounds, and Sam’s Club parking lots. Ah, the romance of the road. In this case, enjoying the journey is not part of the equation. The goal is to get there ASAP without taxing myself, and once at the end goal, get cracking to start making appointments and arrangements of various kinds. Then take a breath and see the kids and grandkids. 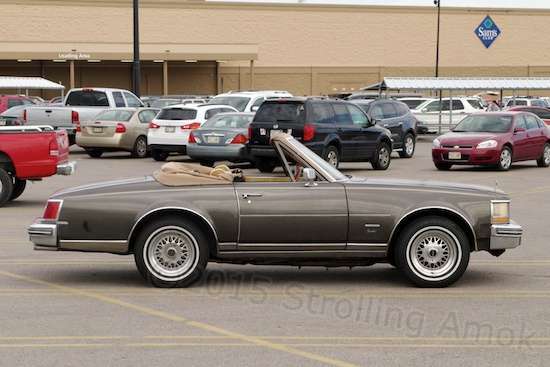 At a Sam’s Club in Nebraska, I looked out the camper window to see an old Cadillac Seville convertible with wonky proportions. Admittedly, even sticking to lowly Interstates all the way still provides scenery galore, and enough ascents and descents to make driving a 16,000-pound rig unsettling. It’s about the only time all year I’ll ever hear the Ford’s thermostatically-controlled cooling fan kick in to assist the radiator in its work, and one of the few times that the transmission will get to control cruising speeds on those long, long downhill toboggan runs. I’d pick a most scenic state, but it’s all scenic in its own way, and it’s all memorable. 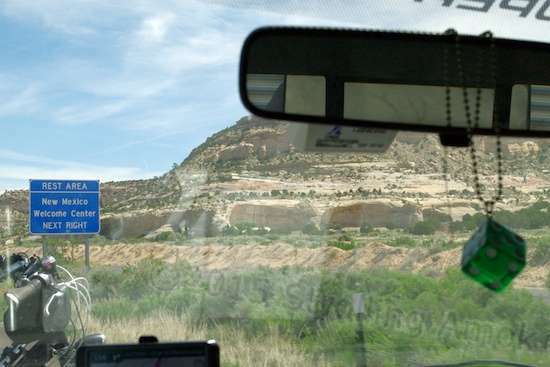 New Mexico’s section of I-40 is exemplary with one exception – the matching between the pavement and bridges at start and end are uneven enough to cause pronounced porpoising as the nose-heavy trailer and the nose-heavy pickup contend for which will be able to bob up and down the most. 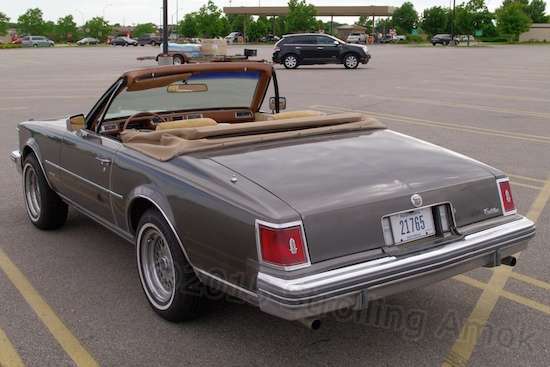 With relatively too much rear overhang and the windshield nearly a foot too far back, it was apparent that someone had carved up a 76-79 Seville to make a 2-seater convertible. Colorado gets the scary award toward the south end, and the boring award at the north end. Nebraska bristles with brilliant green rolling hills and carefully terraced plowing for crops, and radio ads try to bolster corn farmers as patriotic heroes for growing genetically altered corn that few other countries want. I was surprised to find Iowa’s section to be much busier with semi truck traffic than Illinois, yet its pavement is pristine and glass-smooth end to end, while my home state’s dwells in one of only three possible conditions: under reconstruction, roughly patched, or cratered and awaiting patching. Uneven joints between sections of pavement have been known to blow two front tires at once, and it’s not uncommon at all to see potholes surrounded by scraped grooves where suspension components have grounded out. Heck, carelessly drop a wheel off the pavement here, and you can get hung up if your speed is too low. No doubt shock absorber manufacturers come to Illinois to do all of their endurance testing. It only makes sense. I see “the shock that conquered Baja” as empty marketing fluff. Now, “the shock that conquered Illinois roads” would make me perk up and look around. All Sevilles of that series were four-door sedans, so doing this to one was a bit of a big deal. It isn’t that Illinois road builders don’t know what they’re doing. And it isn’t that the political entities that gather bids, commission work and inspect results don’t know what they’re doing. The problem is that they know exactly what they’re doing. Illinois’ taxes are relatively high and rising, and yet the state is eternally bouncing against bankruptcy. The solution, especially in the Chicagoland area, has been to adopt measures guaranteed to drive out businesses, and it has worked commendably over the years. It’s good to be home! It turns out that several coach builders of the day were doing this type of surgery on Sevilles. Sure, it’s misshapen, but kind of awesome in its own way. 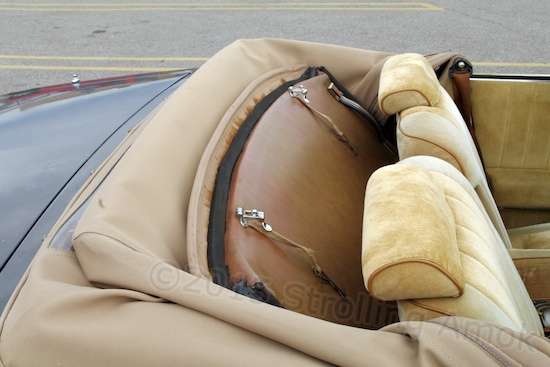 To hash out a practical, working drop-top mechanism is well beyond the ken of backyard builders, and the sight of this prompted me to find out what the story might be with this car. 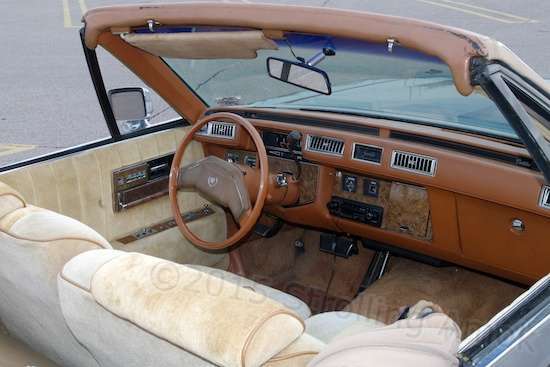 The ’76-’79 Seville itself represented Phase 2 of Cadillac’s new search for buyers younger than 50 – and it too failed. 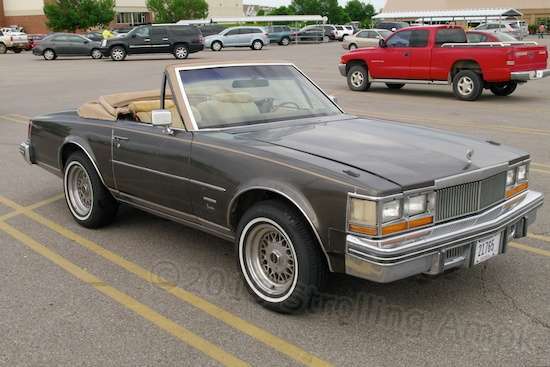 Who bought it were oldsters who wanted a smaller, nimbler version of Caddy than the Large Barge DeVille. Cadillac as a GM brand still awaited the complete redefinition/rebuild of how to attract younger buyers who were more interested in brand image and reputation than in price and features. That said I will share my admiration of some of tbeir new products, looks like a lot of youth appeal to me. But at 60+ what would I know about youth. Thanks, Papa. Youth? That’s easy. They were a peoples formerly inhabiting Colorado, Utah and northern New Mexico, and are related to the Aztecs. Oh wait, that’s Ute. Never mind. I guess I don’t know much about youth today either.